MIA Insights leverages data across the entire medical affairs spectrum, connecting all channels to share the whole story your medical affairs’ data has to tell. With MIA, you also can easily identify trends, streamline communications, and save time and money by reducing the need to manually pull data from unlinked systems that require valuable resource time on a reoccurring basis. The associative model enables users to probe all the possible associations in their data, across all their data sources. 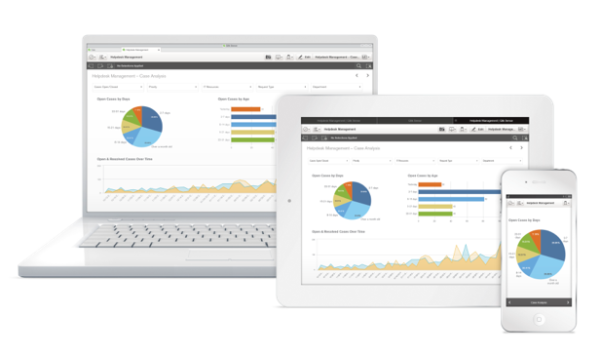 Users can interact dynamically with any of the items on screen to see all connected and disconnected data based on their selections. Additionally, MIA Insights provides superior data integration, enabling the system to cleanse, transform, and unify multiple disparate data sources such as IRMS, Salesforce, Veeva Vault, Documentum and others. Using simple searches, without restrictions, users can evaluate connections with intuitive color cues: green (selected), white (associated), and gray (unrelated). With MIA, your organization can easily visualize trends and metrics and improve collaboration across your entire global medical affairs team. As a result, true cross-channel collaboration is available from R&D to post-market activities. Despite ever-changing regulatory and compliance guidelines, 3vue’s focused experience in medical affairs means you’ll get deeper insights into these highly specialized areas through easy access to your organization’s globally diverse data as well as its users and stakeholders. No wonder 3vue is the choice of five of the top 25 global pharmaceutical companies and other small to mid-market life science companies. 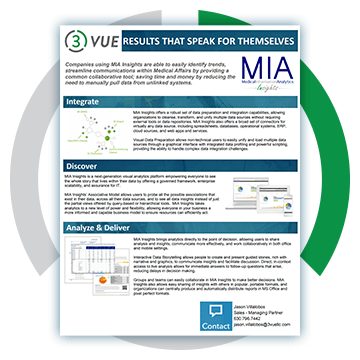 Download the MIA Insights data sheet.